The Header element replaces our old Page Header module. This element has most of the same options as the old Page Headers. If you need help migrating from your old Page Header, see this article. To create a new Header Element, go to Appearance > Elements and click “Add New”. From the Element dropdown list, choose “Header”. Content is required if you want to use the background image option below. The content box accepts any HTML (headings, paragraphs etc. ), shortcodes (slider, contact forms etc.) or template tags. Add custom classes to the header element. The container option is what the page hero background image or color is applied to. Setting this to Full will make the header element span the entire width of the screen. Setting it to Contained will contain it to the global container width. This option refers to the inner container which holds the page hero content. Setting this to Full will make the page hero content span the entire width of the screen. Setting this to Contained will contain the page hero content to the global container width. Choose the horizontal alignment of the page hero content. This option will force the page hero to take up the entire viewport of your page. Note: Requires Merge to be selected in Site Header tab. Add padding to the page hero content. The height of the page hero is determined by the top and bottom padding. 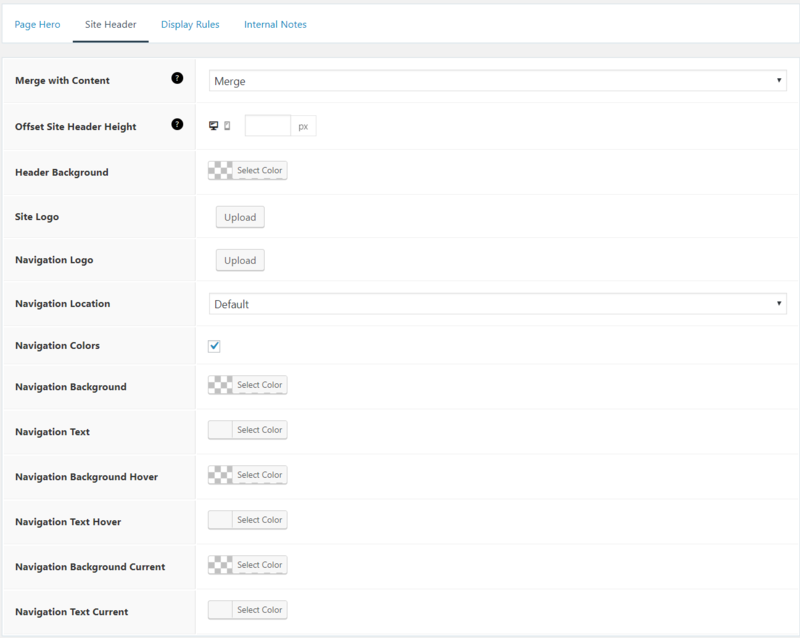 Use the toggle to set different padding for desktop and mobile. Add background image to the page hero content. Featured Image – Use the Featured Image added in the pages or posts as the background image. You can also select a fallback image to show when no featured image is added in the individual page or post. Custom Image – Upload a custom image for this specific page hero. Note: Requires Featured Image or Custom Image to be selected. Enabling this option will apply a parallax effect (moves as you scroll) to the background image. Disable the featured image on posts with this page hero. Use the background color as a background overlay. Set the background, color and link colors for the page hero content. Place your site header on top of the content below it. See more info here and some examples here. Add to the top padding of the page hero to prevent overlapping. Apply a specific header background color to go with this page hero. This would replace the header background color set in the customizer. Apply a specific logo to go with this page hero. This is especially useful if Merge with Content option is enabled. See an example here. Note: Requires an existing logo uploaded in Site Logo. Apply a specific navigation logo to go with this page hero. This is especially useful if Merge with Content option is enabled. See an example here. Note: Requires an existing logo uploaded in Navigation Logo. Use a specific navigation location for this page hero. This would replace the global navigation location set in the customizer. Apply specific navigation colors for this page hero. This would replace the navigation colors set in the customizer. See an example here. 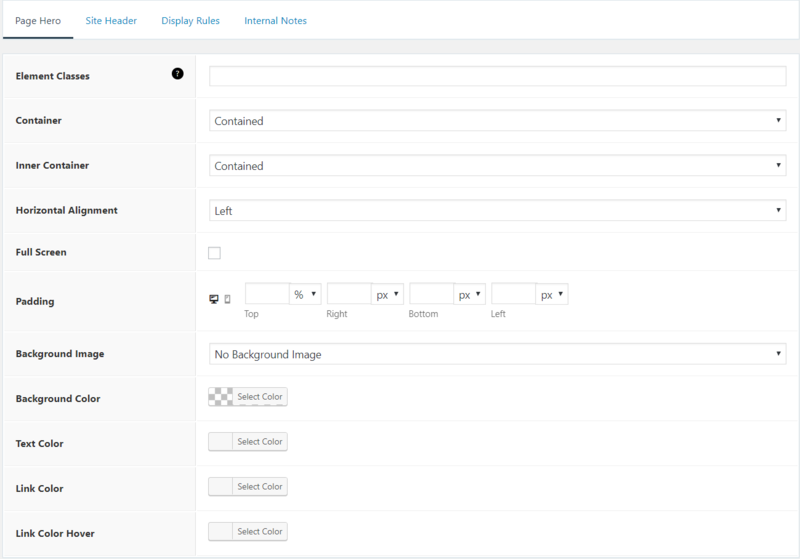 navigation colors settings in the customizer. This tab an optional tab. The content here will not show up at the front end. It is used to help you remember why this element was added.